Each letter is hand stamped and patinised (black finish) so it stands out, or we can leave it silver (clean finish). The font used is upper case calligraphy and the letters are approx 3mm high. It is complemented by a Swarovski crystal and pearl cluster. You can select the colour of the Swarovski crystal that represents their birthstone. There is always more than one birthstone for each month, so if you don't like the one we have chosen please email us for alternatives. You can also select the colour of the pearl in the cluster. There are 2 choices, a white or black pearl. The earrings will match the colour of pearl you select. The crystal and pearl cluster are separate from the silver star. The cluster can be removed from the chain so you can wear just the star on its own or both together. 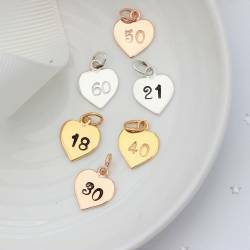 Additional charms can be purchased separately under the charms section. Once we’ve created the perfect personalised necklace and earring set for you, we’ll carefully package it in one of our beautiful black gift boxes with a birthstone gift card. We’ll then finish it with a flourish of ivory ribbon ready for you to give to the lucky lady. The star is approximately 1.2cm, with the loop it hangs approx 1.6cm from the chain. The Swarovski crystal bicone is 6mm. The sterling silver box chains are available in 3 lengths: 16"/40cm, 18"/45cm and 20"/50cm.